"The course gave a boost to my knowledge and confidence which will help me a lot professionally." 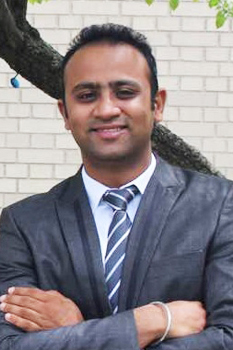 Pulkit Sethi is a Director at Amba Engineers and Project from India. He enrolled in the online course Nanofiltration and Reverse Osmosis in Water Treatment in 2018. The scarcity of potable water and its overuse has resulted in existing water treatment technologies being inadequate to cope up with the growth in demand. As a water and waste water engineer I needed to keep my knowledge up to date with modern treatment techniques so as to give my clients the best possible solutions in the most cost-effective way. Today there are numerous companies working in the field of water treatment so by gaining more knowledge from TU Delft platform I have gained an edge over my competitors. I discovered the course while surfing through the TU Delft website and I was really impressed with the syllabus which covered very practical aspects of design which are often overlooked. I had earlier also done a course on Urban Sewage Treatment from TU Delft via the EDX platform which also proved very beneficial so that was an additional motivation for me to follow this course. It was a great learning experience mostly because a lot of practical aspects of membrane system design were covered along with the appropriate software skills. The discussion forum was very interactive and I got to share the experience and opinions of different people from across the globe. I appreciate the hard work of professors and their participation in discussion forums to make it a wonderful learning experience. The course gave a boost to my knowledge and confidence which will help me a lot professionally. I also became familiar with the good design practices being used in Netherlands. For a working professional like me who cannot do regular courses due to time constraints, this online course proved to be of great value. TU Delft Online learning is an easy platform for people like me to gain access to knowledge from a top ranked college and great professors. I also got to learn from my fellow students who were very active on the discussion forums. Assignments, Tutorials and Practical Examples all added to the value of the course and made for a supportive and enjoyable learning experience. I come from a developing country where the problem of water scarcity is huge and I am sure that I will be able to practically apply what I have learned on this course to make a positive difference. We may live in different countries, but we share the resources that mother nature has provided to us all equally. It is our duty and responsibility to ensure that future generations are not deprived of these resources, so I feel people should take up such courses which teach you to design water treatment plants in an environmentally friendly way. My best advice would be to not just learn for sake of getting a job or earning a certificate but to actually apply it in real life and try to make world a better place to live in.